Using the component [hal_joystick] it is possible to move your CNC machine with a joystick or joypad. 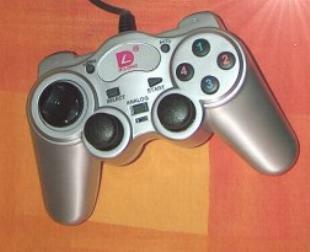 I used a joypad because it has four axes while standard joysticks would have only two. it has a lot of buttons that can be configured to be used with machine functions as coolant, homing, speed etc. it has four analog axes, 12 buttons and the possibility to switch from analog to digital output. With analog you will be able to move your machine proportionally to the little joysticks movements, while the digital input is like an on-off command. With the digital output you can also use the pad on the left. I'm pretty sure that better results in terms of sensibility and precision could be obtained with a higher quality joypad. In order to work with the hal file I'm going to describe, the joypad axes *must* have the 0 at the center, so give float positive values on one side and negative on the other. [Here] is how to check if your joypad outputs the right values. If everything was right, let's understand how it works. Of course writing a new hal component that converts directly the float input from joypad axis to an integer counter output is possible (and easy), but this requires more knowledge, while the method described here only requires components that are already provided with EMC2. Also using that method it is easy to update the system from joypad to a jogwheel. If you are interested in how to write the new hal component described, [here] you will find instructions. Now we will examine the hal file needed to do that. If you're still not familiar with HAL, I suggest you to read the [Hal Manual] that has very helpful tutorials in it that allow you to understand very well how HAL works. I'm assuming that your joypad is in /dev/input/js0, if not, please change the line according to your configuration. Now you could use this hal file to jog. Just save it for example with the name pad.hal and add a line HALFILE = pad.hal at the end of the [HAL] section of your .ini configuration file. Now we are going to attach some functions to the joypad buttons. We will see two examples, in the first we will use two buttons to set the jog scale parameter; pressing the first button will set it to 0.1, pressing the second will set it to 0.01. 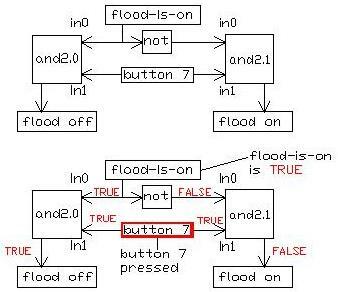 In the second example we will use only one button to toggle flood on and off. To do that we will use [Halui]. 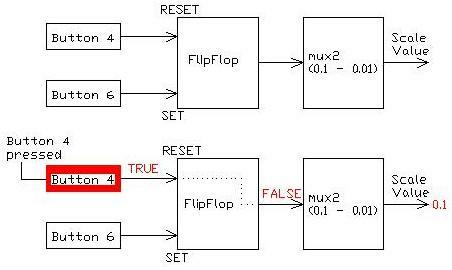 Halui provides a lot of HAL pins to command some EMC2 functions. To use Halui you've to add the line HALUI = halui just after the line [HAL] in your .ini configuration file. Work DONE! In the same way you can attach other functions to buttons as you like. If you want to donwload it, the complete halfile is [here]. If you want to use it don't forget to add HALFILE = joypad.hal at the end of the [HAL] section of your .ini configuration file.